Last weekend David Dale wrote an article in the Sydney Morning Herald regarding the teaching of Australian history in our schools. His article was prompted by the fact that the newly formed National Curriculum Board have commenced their meetings to start building a syllabus for History, English, Science and Mathematics. The new syllabus will come into effect in 2010. I am personally not sure how this new Board will achieve their goals given that they are only meeting on a few occasions and their numbers are few. I personally have mixed emotions about the teaching of Australian history at present. More on that later. I take exception to one Mr Dale’s statements, “Traditionally history lessons convinced kids Australia is one of the most boring places on the planet.” Which history lessons, Mr Dale? Elsewhere Mr Dale raises some good points. Yet, I wonder if he realises that all of the historical incidents that he listed in the article could not be taught in the current complusory Australian history course in NSW as they all took place before 1900? Now, Australian history may not be as bloodthirsty or as thrilling as some episodes during the course of world history yet it is still possible to bring the content to life and make it relevant for the students. One thing that annoys me about the teaching of Australian history here in NSW is that in recent years politicians have determined much of what and when we teach as opposed to historians and educators. This is frustrating. During the Howard years a jingoistic approach has crept into the teaching of the subject. Some politicians want teachers to be politically correct as we teach the subject. I teach Australian history to Years 9 and 10 over a two year period. It is compulsory. I feel that the decision to make Australian history compulsory for students of Years 9 and 10 to be a poor decision. The syllabus content is tedious at times and admittedly it is challenging to engender interest and excitement in that specific content. The compulsory 100 hours of Australian history should be taught either to Years 7 and 8, either in a single 12 month period or over the two years in tandem with the Australian geography course. The Australian history taught should be comprehensive and not limited to the twentieth century. Following that the Year 9 and 10 students should be allowed to select History as an elective. That elective subject should have a sweeping syllabus that covers world history, ancient through to modern and across all continents, including Australia. History should be an elective for the older students. The subject will attract a core of students interested in History. They can take that interest into senior subjects and then on to the community. The politicians should leave the structure and content of the syllabus up to the teachers and not peddle their political or ideological agendas via our classrooms. David Dale posed the question to his readers, “What should be in the core curriculum for Australian history?” A number of respondents suggest a wide range of topics and a number of students point out the boring aspects of the current syllabus. One students mentions how they are taught too much Australian history. This may not be entirely correct yet I can understand their sentiments given the structure of the syllabus. We have limited hours in which to teach the course and as a result it is difficult to sink one’s teeth into the content. In NSW we have two constraints on good history teaching practice and they apply before any teacher gets into a classroom. Firstly, the Primary School syllabus limits Australian History content to the 19th Century if it is taught at all (with all the other subject and topics our overworked Primary teachers are required to do). Secondly, in High School we are limited to a shared (half) teaching load with Geography yet we still have a School Certificate exam. Because of this, content coverage is superficial in many areas in the interests of keeping our SC exam results at a satisfactory level. (Have a look at the SC Australian History exam sometime if you don’t believe the politicisation of the curriculum). The ones who generally get forgotten are the students themselves, as has been shown by some of the earlier posts. I expect I’ll be howled down as one of those dreadfully biased teachers who ignores all the really important aspects of our history. However there are a lot of very dedicated History Teachers in NSW and no doubt across the country who would just like to be given a fair go at being able to deliver an interesting story that can both inspire as well as educate our students. Other readers of David Dale’s article contributed salient points. Others did not. It makes an interesting read, particularly for teachers and students of Australian history. And finally, one respondent Tony Flander made an impassioned plea that some of the lowest ebb of human decency should be taught. Do not worry Mr Flander, it is being taught. After all, History should at least engender in us all a desire not to repeat the errors of the past. However, the album was withdrawn from EMI’s release schedule and it did not come to pass. No vinyl or CDs were pressed. A number of printer proofs for the sleeve were created. One of these was recently auctioned on eBay. Before all the sleeves for the album were destroyed a few were salvaged and others were used as packaging material for other albums as delivered to retail outlets. These were subsequently passed on to fans. 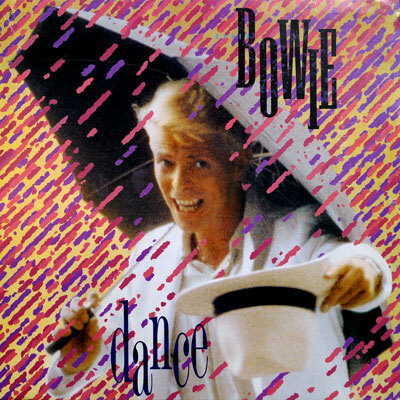 The sleeve artwork is not that brilliant and it seems that EMI was attempting to recapture the hype that surrounded Bowie in 1983 at the time of his hit album Let’s Dance and the Serious Moonlight Tour. Download a high resolution image of the sleeve. Singaporean bloggers have been very hard at work in recent weeks and in particular this weekend. First of all a group of Singaporean bloggers, known collectively as the ‘media socialists‘ have been quite busy. They are not ‘socialists’ per se. They are a group of academics, civil servants, consultants and designers who are passionate and actively involved in social media, or what many people call “new media”. A group of the media socialists devoted a rather busy week creating a response, via a collaborative wiki, to the recent AIMS Consultation Paper advising the Singaporean government on engaging citizens through new media. This form of collaboration and selfless sharing demonstrates how blogging and social media can be utilised to connect with governments and organisations. Individuals can come together collectively to achieve outcomes that would have been so difficult for an individual. Another group of Singaporean bloggers have also contributed to the debate. You can read all about the work of the media socialists here. I am heartened by the knowledge that the media socialists have included myself in their ranks due to my connections with the island state and personal friendships with a number of the actual bloggers. 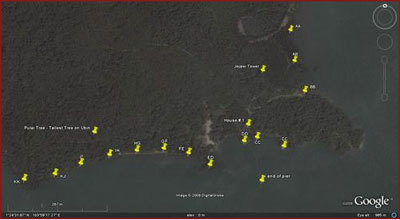 On a separate front my friend Siva has been co-ordinating the International Coastal Cleanup Singapore. This involves 3000 volunteers. Blogging and connectedness play a crucial role in harnessing the volunteers, gathering data and publishing results. I remember back in 2001 and 2002 results were being published within minutes of the cleanup conclusion. Tonnes of rubbish are cleared away from beaches and mangroves during the cleanup. 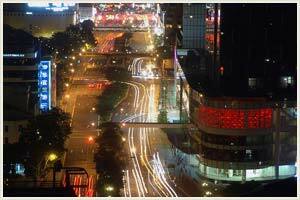 Siva provides updates via his blog and the ICCS blog. The cleanup is happening today, as I type, and already several updates have been posted to the blog. Siva uses blogging and the net to bring together students, teachers, and members of the community to work on environmental and other projects that benefit the people of Singapore. Siva has been using blogs as a tool to augment his research and teaching for at least five years now. Here are some of his blogs, those of his students and blogs that he contributes towards. I would not be surprised that if one looked up the term blog in an illustrated dictionary there would be photographs of Siva and Kevin within the text of the definition. They are the definitive bloggers. Most of all they achieve measurable outputs. They are productive. They assist the community. I wish I was in Singapore right now. A couple of weeks ago the students of our school participated in a walkathon to raise money for several charities. The students walked along the southern shores of Lake Illawarra to the mouth of the lake where it meets the Pacific Ocean. 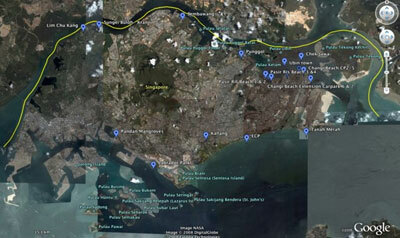 The journey there and back was about 13 km. I took 23,748 steps according to a pedometer. During the walk I took a few photographs with a small Casio digital pocket camera. I photographed the Illawarra escarpment. I was standing on the eastern shores of the lake and, pointing west, took a few photographs of the escarpment. I stitched a couple together using Photoshop Elements. To make up for the differing exposures I adjusted the levels slightly. 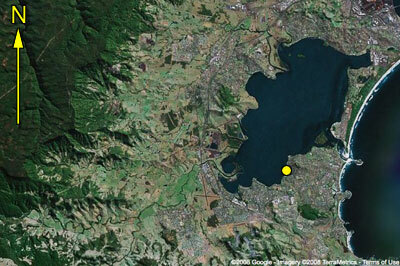 The yellow spot on the Google Map above marks my approximate position. 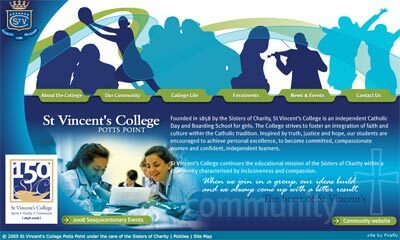 Conducted a blogging and edublogs workshop at St Vincent’s College in Potts Point, Sydney at the conclusion of the school day. Chris Morris, ICT Coordinator at the school, organised this workshop as part of a series of workshops that covered such areas as Second Life, Wikis, RSS feeds, Google Reader and Flickr. It was an excellent opportunity for staff to explore all of these possibilities. I had the pleasure to work with a most interested and receptive group of teachers. I shared with them the possibilities and realities of blogging with students. Management issues were covered yet I also pointed out the advantages in simply allowing students to open their own edublog accounts and then to invite their own teacher to be co-author. Empowerment and responsibility. The pro and cons of different types of blogs were raised during the workshop. My main message was to take small steps and gradually evolve from that point. The workshop was most enjoyable. I was most impressed with the staff, the students and the school. While waiting for the Edublogs site to happen at various points during the workshop I whipped open a couple of tabs on the Firefox browser and shared Compfight and Posterous with the teachers. One of the best things was the fact that I simply conducted the workshop using the presentation desktop computer in the computer lab. I did not use my MacBook. The portability, accessibility and cross-platforn nature of all these tools is simply useful. An updated edublogs workshop document and related presentation can be downloaded from this page.